The statue’s creators, Art Rise Up, said they were inspired to create the work and present it to Mr Javid after visiting the Pont Valley in County Durham, where local residents and national campaign organisations including 38 Degrees are contesting an imminent new opencast coal mine, set to go ahead this spring. 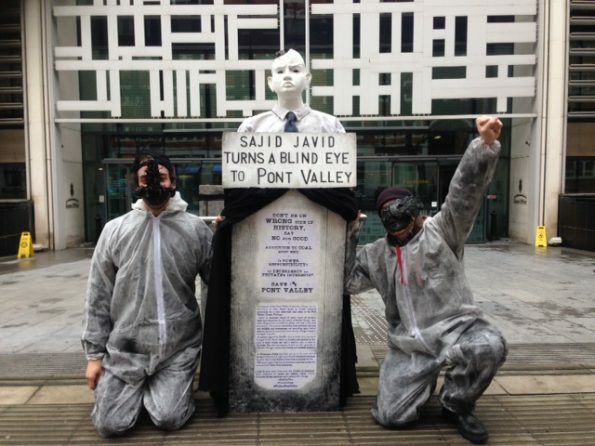 In February a petition saw over 88,000 people urge Javid to use his powers under the Town and Country Planning Act to revoke the permit for opencast coal extraction, held by Banks Group. 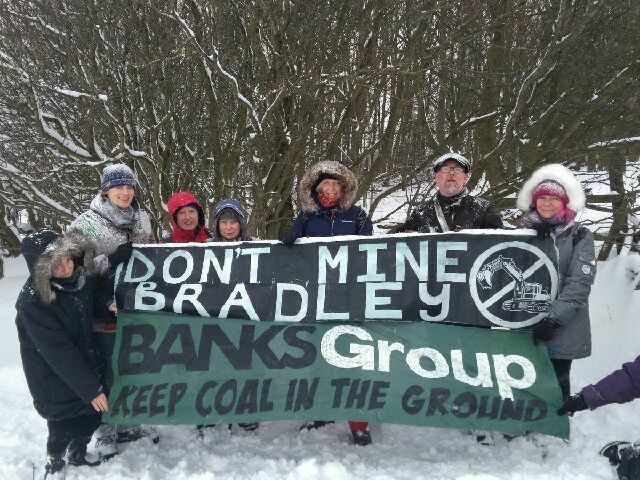 Banks Group announced they had acquired the permit to mine at Bradley in the Pont Valley from the liquidated company UK Coal, and intended to start opencasting in spring 2018. UK Coal had secured permission in 2015 after a 30 year battle with local people over the proposals who previously defeated the proposals at three public inquiries. Banks Group’s application to mine at Highthorn, beside Druridge Bay was approved by Northumberland County Council in summer 2016 but was called in by Sajid Javid who refused the application after an inquiry on the basis of climate change, landscape and heritage site removal. In the absence of a response from Mr Javid, local residents and activists launched a direct action camp to prevent Banks Group from entering the site to start the opencast mine. The camp has prevented the preparatory work starting since 19th March. Durham County Council planned roadworks schedule shows 19th March Banks Group intending to build the access road to the proposed site on the A692. Thomas Davison, a local resident living 300 metres from the contested land, said ‘After over 30 years of successfully fighting through the planning system we’re now resorting to petitioning the Secretary of State as well as establishing a protection camp in the Pont valley as a form of peaceful direct action. The artists behind the statue are members of Arts Rise Up, a collective which aims to merge art and activism. Our purpose is to tackle political and social issues of our times using art forms such as Performance, Fine Arts and Multimedia. We intend to embody a plea for change, supporting key campaigns with critical artwork. Sajid Javid sculpture, has been conceived in collaboration with The Nave, a community of creatives promoting social consciousness.